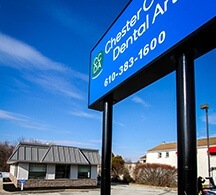 Welcome to Chester County Dental Arts! With over 17 years of experience perfecting patients' smiles in Philadelphia and Los Angeles, Dr. Mark Simeone offers all his patients comprehensive dental care in a state-of-the-art practice. Dr. Simeone founded Chester County Dental Arts in 2016 with the hope of bringing a practice to the region that was different. We are different because we offer a "no shame dentistry" environment where everyone is welcome and shouldn't feel nervous or shameful about their teeth. We want you to have the smile you deserve. There’s no greater compliment for our team than when patients trust us with generations of their family’s smiles for years to come. We offer multiple specialities under one roof as a convenience to our patients as we know how busy everyone is. There is no need to travel to multiple offices to see Orthodontic, Implant, Cosmetic or Full Smile Makeover care. We do it all in house. We thank you for trusting our knowledgeable team with your dental care. Contact Dr. Simeone or our practice manager, Christina Lawler, at 610-383-1600 to schedule your first visit today. In order to offer some of the most advanced dental treatments in Chester County, including dental implant tooth replacement and orthodontic treatments, we need to incorporate the right tools. For us, that means using 3D image scanning. Traditional x-rays give us a pretty good view of one area of your smile, but 3D imaging allows us to see how the entire bite works together. It also gives a more complete view of individual teeth, so we know how advanced tooth decay is or how deep a crack in your tooth has gone.